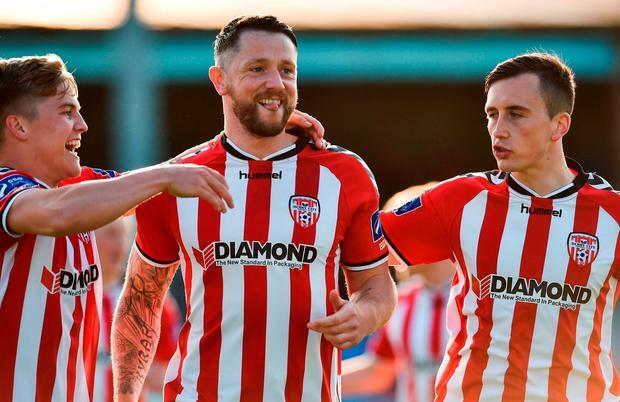 Goals early in each half from Rory Patterson and Josh Daniels secured Derry City safe passage into the third round of the FAI Cup last night with a 2-1 win over Drogheda United. Patterson, who recovered from a knee injury to start, gave Derry the lead after just four minutes. His 25-yard free-kick left Stephen McGuinness rooted to his spot. However, the goalscorer limped off shortly afterwards. Drogheda's equaliser came from the penalty spot on 35 minutes, when Sean Thornton sent Ger Doherty the wrong way. Ten minutes after the restart, Derry regained the lead. Austrian full debutant Lukas Schubert found Daniels and he curled a superb effort over McGuinness. Elsewhere, Alan O'Sullivan popped up with a dramatic 117th-minute winner for Athlone in their match against Ulster Senior League battlers Letterkenny. Just when Intermediate Cup finalists Rovers looked to have earned penalties, O'Sullivan tucked Emeka Onwubiko's cross past Rory Kelly. It was tough on Rovers, who twice went close at the end of normal time. Steve Okakpu-Emeka had both chances, with one cleared from the line before he smashed a header off the bar, while Val Feeney was denied by a goal-line block from David Shovlin at the other end.